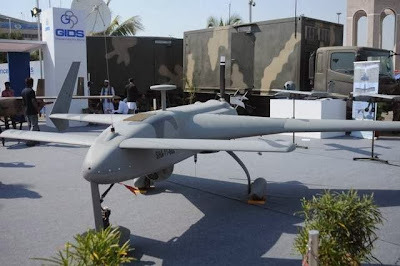 Last week, two indigenously built drones, named Burraq and Shahpar, were inducted into Pakistan Army and Air Force to deal with both internal and external threats. A press release by the military's Inter Service Public Relations (ISPR) announced that Pakistan had inducted its first fleet of “indigenously developed Strategic Unmanned Aerial Vehicles (UAVs), namely Burraq and Shahpar UAV Systems” for the Army and the Air Force. 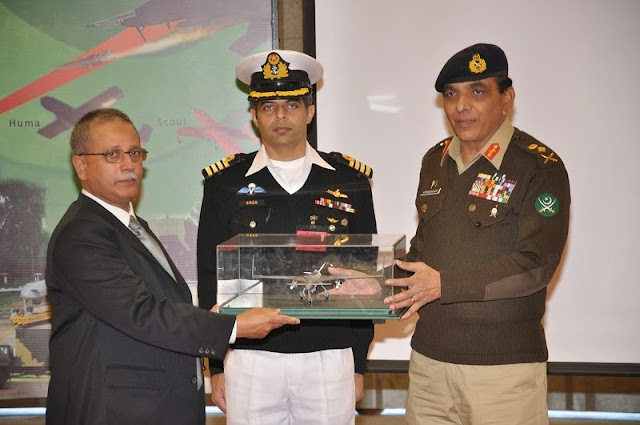 While the press release provided no other information, an photograph released by ISPR showed a model of a canard pusher UAV that appeared to be armed with two under-wing missiles. Shahpar is a tactical UAV is capable of carrying 50 Kg payload and stay aloft for 8 hours. Burraq has the capacity for 100 Kg payload with 12 hours endurance, according to Defense News. Initially, both will serve as reconnaissance platforms to gather and transmit real-time operational intelligence. In future, Burraq will likely be deployed as an armed UAV to carry and launch laser-guided missiles. Burraq, based on CH-3 specs, would carry around a 100-kilogram payload and 12 hours endurance,” he (analyst Usman Shabbir of the Pakistan Military Consortium think tank) said. The given payload of the (Chinese) CH-3 is a pair of AR-1 (laser-guided) missiles, or a pair of FT-5 small diameter bombs. The ability of Pakistan to field an armed UAV has great benefits when faced with time-sensitive targets, he said. “It is important in a sense that it greatly cuts the gap from detection to shoot,” he said. Adding, “Earlier, once you detected something and wanted it taken out you had to pass on the imagery to higher ups, who had to approve and allocate resources like aircraft and by the time the aircraft got there the bad guys were long gone. Now detect, make decision, shoot and go home — all in same loop.” He does not believe there is any real significance in the systems being named for use with both the Army and the Air Force, however, as “both have been operating their own UAV squadrons for a while now.” “The Army has been using German EMT Luna X-2000 and the British [Meggitt] Banshee UAVs, while PAF as we know has a lot of faith in the Italian [Selex] Falco,” he added. The Luna was also ordered by the Pakistan Navy in June 2012. The new drones represent a significant advance in Pakistani military's counter-insurgency capacity and battle-readiness for any major conflict in the region. How come its indigenous when it's a copycat of Chinese drones? Moid: " How come its indigenous when it's a copycat of Chinese drones?" Techies should know that following a spec is not copy cat. is it propeller driven or jet engine driven? Uzair:"is it propeller driven or jet engine driven?" None of the drones use jet engines...most, including US predator, sound like a lawn-mower flying overhead. Anon: "Good for them, but yet shooting down American drones are a far reach to PAF and Pak Army......."
Pakistani military can shoot down US drones. It's easy. But there are consequences of such an action which aid-dependent Pakistan seeking IMF bail-out can not deal with. (CIA Informant) Hassan: We are at war, and I am part of this war. When does a war make sense? To be honest, I think the US drone missions are the right thing to do. Believe me, no weapon is more effective in fighting extremists. Hakimullah Mehsud, the head of the Taliban for many years, was killed on Nov. 1. Many other more or less high-ranking extremists were killed before that. From a military standpoint, it's a success for the United States. And I contribute to that success. If you aren’t nervous enough reading about 3-D printers spitting out handguns or Google robots with Android phones, imagine the skies thick with crisscrossing tiny drones. “I know this looks like science fiction. It’s not,” Jeff Bezos told Charlie Rose on “60 Minutes” Sunday, unveiling his octocopter drones. The Amazon founder is optimistic that the fleet of miniature robot helicopters clutching plastic containers will be ready to follow GPS coordinates within a radius of 10 miles and zip around the country providing half-hour delivery of packages of up to 5 pounds — 86 percent of Amazon’s stock — just as soon as the F.A.A. approves. “Wow!” Rose said, absorbing the wackiness of it all. So if they can’t land on my head, why do they make my head hurt? Maybe because they are redolent of President Obama’s unhealthy attachment to lethal drones, which are killing too many innocents in Afghanistan and Pakistan, and our spy agencies’ unhealthy attachment to indiscriminate surveillance. Or maybe they recall that eerie “Twilight Zone” episode where a Brobdingnagian Agnes Moorehead fends off tiny spaceships with a big wooden stirrer — even though these flying machines would be dropping off the housewares. Or maybe it’s because after “60 Minutes,” “Homeland” featured a story line about a drone both faulty and morally agnostic. The White House chief of staff, wanting to cover up a bolloxed-up covert operation on the Iraq-Iran border, suggested directing the drone to finish off its own agent, Brody. Journalists, police and paparazzi jumped on the drone trend. One photographer dispatched a drone over Tina Turner’s Lake Zurich estate to snap shots of her wedding last summer — before police ordered it grounded. Of course, for the robophopic, there is already a way to get goods almost immediately: Go to the store. Anon:None of the drones use jet engines...most, including US predator, sound like a lawn-mower flying overhead. Predator C Neuron Taranis Skat Aura"
Predator C uses turbofan, not jet engine. Neuron is still experimental, not deployed. Others are also experimental. A turbofan IS a type of a jet engine! Infact the most common type!! All airliners use turbofan jet engines! Future wars, the Doctrine states, “will be characterised by high-intensity, high-tempo operations under a relatively transparent battle-space environment.” This, it states, is because of the “incremental increase in asymmetry of conventional forces and [the] nuclear overhang” — evident references to the programme of rapid modernisation India put into place after the 2001-2002 crisis, and both countries’ efforts to expand their nuclear weapons capabilities. “What worries Pakistan’s army,” says the former Indian Army vice-chief, Arvinder Lamba, “is their inability to organise offensive or defensive responses to our growing rapid mobilisation capacity. Their challenge is to deter us from striking by threatening nuclear weapons use in the face of the least provocation. “India’s government and military must seek perceptual clarity on exactly what we intend to do in the face of such threats,” he said. QUOTE: "Army’s mother document says growing Indian military power “disturbs strategic equilibrium of the region”..."
B) India has 1,240 million people with 4,800 billion$ economy. Do you see any "equilibrium"? Is that even possible? Is there a power equilibrium between US and Mexico? Should the US limit its military spending so as not to "disturb the strategic balance" in North America? Yes? What are your views? HWJ: "Is there a power equilibrium between US and Mexico? Should the US limit its military spending so as not to "disturb the strategic balance" in North America?" Mexico is not a nuclear power. Pakistan is. Nor is India a "superpower". US is. In fact India is superpoor, not a superpower. Nukes are a great strategic power equalizer between India and Pakistan. So why do we need to spend billions on the military? Can we not use those billions on developing our economy? I am not a military person but whenever I say that many military people take offense. I think the military plays the India card so they can justify the billions. QUOTE: "....Initially, the 1.1 kg pico-satellite will transmit a continuous wave Morse code signal with the message “ICUBE-1 First CubeSat of Pakistan”...."
But, but, but... why can't we launch a measly 1 Kg song-playing satellite into Low Earth Orbit (LEO) ourselves? Didn't you say that we have a 'vast military industrial complex' that produces sophisticated IRBMs? So why are we asking the Russians to launch a lousy 1kg satellite into LEO? Kadeer: "So why do we need to spend billions on the military? " Dispensing with minimum conventional deterrence would require nukes on hair-trigger alert making accidental nuclear war between geographically continuous rivals more likely. HWJ: "So why are we asking the Russians to launch a lousy 1kg satellite into LEO?" The students at IST who built it are not in delivery business. They have many commercial delivery services to choose from around the world. In a second edition, the groups said they widely underestimated the impact in China and calculated that the world's most populous country would face severe food insecurity. The drone that spied on bin Laden and on Iran's nukes was just the start. Meet its bigger, higher-flying, stealthier cousin, the Northrop Grumman RQ-180. It's probably been flying for a few years now, but you weren't supposed to know that; the existence of this secret project, based out of Area 51, was revealed Friday by Aviation Week. The existence of the RQ-180 has been long rumored. Cryptic public statements by U.S. Air Force officials indicated a secret high-altitude reconnaissance drone, and Northrop officials frequently reference the broad strokes of the program. For that matter, it is likely not the only classified unmanned aerial vehicle, or UAV. Other companies, including Lockheed and Boeing, also have a stable of smaller secretaircraft. The RQ-180 is likely flying from the secret Air Force test facility at Groom Lake, Nevada, widely known as Area 51. Its exact specifications, including such crucial details as the number of engines, is unknown, but Aviation Week suggests a wingspan of over 130 feet, based on hangar construction at Northrop's Palmdale, California facility. The number of aircraft built is also unknown; however, a flight test program, relatively quick entry into service and open budget documents suggest a small fleet are flying routinely. One such aircraft is Lockheed's RQ-170, first shown to the world in grainy pictures from Kandahar air base, Afghanistan, but only officially acknowledged after one crashed almost-intact in Iran. The RQ-170 was (and maybe still is) tasked by the CIA to spy on Iran's contentious nuclear program. The drone was reportedly used to spy on Osama Bin Laden in Pakistan before and during the raid that killed him. RQ-170 has also been reported in South Korea, possibly to look at North Korea's nuclear program. RQ-170 was impressive, but limited: it showed only some stealth characteristics, and was widely believed to be slightly outdated by the time it was discovered. The larger and stealthier RQ-180 would be able to fly higher, longer, allowing the CIA to watch the same targets for days at a time, and -- just maybe -- spy on more sophisticated countries. KAMRA, PAKISTAN — Pakistan on Wednesday launched production of a new version of a combat aircraft featuring upgraded avionics and weapons system. The plane, to be called Block-II JF-17, will be manufactured at the Pakistan Aeronautical Complex west of Islamabad, which has so far produced 50 older-model Block-I JF-17s for the air force. The complex on Wednesday formally handed over the 50th indigeneously produced Block-I JF-17 Thunder aircraft to the air force at a ceremony presided over by Prime Minister Nawaz Sharif. The JF-17 Thunder has been co-developed and co-produced with the China National Aero-technology Import and Export Corporation. “The indigenous manufacturing of JF-17s will not only lead to self-reliance and industrialization but will also further strengthen Pakistan’s friendship with China,” Sharif told the ceremony. “The first Block-II JF-17 will be ready by June next year,” chief project director Air Vice Marshal Javaid Ahmad told AFP. The Block-II will have improved versions of avionics sub-systems, air-to-air refueling capability, additional weapons carriage capability and some extra operational capabilities. Ahmad said several countries in Central Asia, South America and Africa had shown interest in buying the new plane. The Pakistan Aeronautical Complex, which overhauls and rebuilds the air force’s whole range of combat aircraft, has the capacity to roll out 16-25 aircraft per year. ..They've been strapped to children's bicycles, hidden inside water jugs and even hung in tree branches. A few years ago, Air Force brass noted that some "drones are useless in contested airspace," said Kreps, meaning they're no match for enemy fighter planes. But the technology has advanced quickly and more governments — including China, India, Turkey and Pakistan — are developing drone and anti-drone programs. "The technology has become lighter and smaller, creating a different set of vulnerabilities for typical air defense systems — hence the need for this kind of system that can counter smaller-scale drones that could actually be more insidious," she said. Since 2008, the United States has conducted more than 1,700 drone strikes in Afghanistan, Iraq, Libya, Pakistan and elsewhere, as Kreps explained in a recent Foreign Affairs article. The US has killed more than 450 people with drones, according to Kreps. The United Kingdom has deployed drones in Afghanistan. Israel has flown drones in Palestine. Israel also shot down a drone operated by the Palestinian militant group Hamas during the Gaza Strip conflict earlier this year. The proliferation of drones has led Kreps to question if they make warfare too easy because they don't expose pilots to danger. She and others have argued that President Barack Obama and his predecessor, George W. Bush, have routinely authorized drone attacks in airspace where they would be reluctant to send manned warplanes. Now, China is facing similar questions as it beefs up its drone arsenal. China and Japan have rattled sabers over Chinese drones that were flying over islands claimed by bother countries in the East China Sea. Upping the stakes, Japan last year publicly adopted a policy to shoot down drones if they ignored warnings to leave Japanese air space. That's a looser standard than for manned aircraft, which become targets only if they pose a threat to Japanese nationals. China, meanwhile, has said it would consider an attack on a drone as an act of war. The anti-drone laser defense system is an example of China flexing its muscles at a time of rising tensions in the Pacific region, Kreps said. But it would be a shame if it emboldened Chinese leaders to go to war and jeopardize millions of lives just because Japan blew up a high-tech remote-controlled aircraft. Pakistan’s first homegrown armed drone Friday successfully test-fired a laser-guided missile with a pinpoint precision, Samaa reported. According to Inter-Services Public Relations (ISPR), the military’s media wing, the indigenously developed advanced Unmanned Combat Aerial Vehicle (UCAV) ‘Burraq’ armed with a new air-to-surface missile ‘Barq’, which means lightning, were tested at an undisclosed location Friday. Chief of Army Staff (COAS) General Raheel Sharif and other senior commanders were present onthe test site, said a tweet posted by DG ISPR Asim Bajwa. After witnessing a successful test-fire, the COAS patted on the back of all the engineers/scientists who worked day in day out to stand Pakistan on the map of the developers of hi-tech UCAVs. Bajwa quoted the army chief as terming it a great national achievement, which would help the armed forces rev up their anti-terror crackdown. The drone, Burraq, which translates as "flying horse from the heavens" was jointly worked up by Pakistan Air Force (PAF) and the National Engineering and Scientific Commission (NESCOM), a civilian defence research and development organisation. It is pertinent to note that United States has run a controversial drone programme against militant hideouts in northwestern tribal areas bordering Afghanistan since 2004. Pakistan publicly opposes the missile strikes by US drones, terming them a violation of its territorial sovereignty and has long asked the US to give them the technology required to run their own programme. Washington pressed Islamabad for years to wipe out the Islamist militant hideouts in the North Waziristan tribal area, which has long been a safe haven for Al-Qaeda and the homegrown Tehreek-e-Taliban Pakistan (TTP) as well as foreign fighters such as Uzbeks and Uighurs. In a significant breakthrough, the country’s army announced on Friday it had successfully test-fired a missile from an indigenously developed drone – a technical feat few nations have managed. Army chief Raheel Sharif was among the engineers and scientists who witnessed the demonstration of a technology that has largely been the reserve of a few countries, such as the US and Israel. The army said the drone, named Burraq after the flying horse of Islamic tradition, successfully hit stationary and moving targets with its Barq laser-guided missile with “impressive pinpoint accuracy”. The system would be a “force multiplier in our anti-terror campaign”, said an army spokesman, Asim Bajwa. Developing homemade drones has been a priority for Pakistan given the extensive use made of them since 2004 by the CIA to target terrorist groups in the restive north-west tribal belt. The controversial weapons have proved irresistible given their ability to linger over their targets for extended periods of time, collect intelligence and deliver deadly missiles far more cheaply than conventional aircraft. But the US supplies only its most trustworthy allies with the capability and has refused repeated requests from Pakistan, which has been attempting to join the club of countries with armed drones for at least two years. Although it already has surveillance drones, arming them requires numerous technical problems to be overcome. During the ongoing “Operation Zarb-e-Azb” operation against militants in North Waziristan, a major sanctuary for militant groups bordering Afghanistan, the country has made extensive use of bombs dropped from fighter planes. The army has repeatedly claimed no civilians were killed in the extensive air campaign, but the claim has been impossible to verify. US drone attacks have been decried by many Pakistanis and activists around the world who claim innocent lives have been lost and entire civilian populations traumatised by the continued presence of drones. Islamabad makes diplomatic protests against US drone strikes as a matter of routine, although there is considerable evidence Pakistan has given its consent to the strikes. Although the military recognise the US drone campaign have been effective many believe they are an unacceptable infringement on the country’s sovereignty. According to the independent Bureau of Investigative Journalism, the CIA has carried out 413 drone strikes in Pakistan since 2004. The global proliferation of armed aerial drones took a major leap forward Friday when Pakistan’s military said it has successfully tested its own version and will soon deploy them against terrorists. The drone, designated the Burraq, will be equipped with a laser-guided missile capable of striking with pinpoint accuracy in all types of weather, the military said. In the Koran, Burraq is the name of the white horse that took the Islamic prophet to heaven. “It’s a great national achievement and momentous occasion,” Sharif said. Pakistan’s decision will likely accelerate the already supercharged race among nations to follow in the footsteps of the United States by deploying unmanned aircraft as an instrument of war. According to the New America Foundation, there is evidence that eight other countries — the United States, South Africa, France, Nigeria, Britain, Iran, Israel and China — have already put weapons onto unmanned aircraft. The United States, Britain and Israel are the only three that have fired a missile from a drone during a military operation, the foundation said. Peter W. Singer, a senior fellow at the New America Foundation, said Pakistan’s test confirms that the use of drones in warfare is here to stay. “This is not the start of the race; it’s mile seven of the race,” said Singer, adding that India will probably also be able to quickly deploy an armed drone. Still, he cautioned, the introduction of drones into Pakistan’s arsenal is not likely to alter the balance of power between the two nuclear-armed countries. "There's already a hardware store [in California] that has a customer service robot that, for example, is capable of leading customers to the proper place on the shelves in order to find an item," Ford tells Fresh Air's Dave Davies. "As we look forward from this point, we need to keep in mind that this technology is going to continue to accelerate," Ford says. "So I think there's every reason to believe it's going to become the primary driver of inequality in the future, and things are likely to get even more extreme than they are now." Any jobs that are truly repetitive or rote — doing the same thing again and again — in advanced economies like the United States or Germany, those jobs are long gone. They've already been replaced by robots years and years ago. So what we've seen in manufacturing is that the jobs that are actually left for people to do tend to be the ones that require more flexibility or require visual perception and dexterity. Very often these jobs kind of fill in the gaps between machines. For example, feeding parts into the next part of the production process or very often they're at the end of the process — perhaps loading and unloading trucks and moving raw materials and finished products around, those types of things. But what we're seeing now in robotics is that finally the machines are coming for those jobs as well, and this is being driven by advances in areas like visual perception. You now have got robots that can see in three-dimension and that's getting much better and also becoming much less expensive. So you're beginning to see machines that are starting to have the kind of perception and dexterity that begins to approach what human beings can do. A lot more jobs are becoming susceptible to this and that's something that's going to continue to accelerate, and more and more of those jobs are going to disappear and factories are just going to relentlessly approach full-automation where there really aren't going to be many people at all. There's a company here in Silicon Valley called Industrial Perception which is focused specifically on loading and unloading boxes and moving boxes around. This is a job that up until recently would've been beyond the robots because it relies on visual perception often in varied environments where the lighting may not be perfect and so forth, and where the boxes may be stacked haphazardly instead of precisely and it has been very, very difficult for a robot to take that on. But they've actually built a robot that's very sophisticated and may eventually be able to move boxes about one per second and that would compare with about one per every six seconds for a particularly efficient person. So it's dramatically faster and, of course, a robot that moves boxes is never going to get tired. It's never going to get injured. It's never going to file a workers' compensation claim. More than a thousand artificial intelligence researchers just co-signed an open letter urging the United Nations to ban the development and use of autonomous weapons. The letter was presented this week at the 2015 International Joint Conference on Artificial Intelligence in Buenos Aires, Argentina. Tesla and SpaceX CEO Elon Musk and physicist Stephen Hawking signed the letter, alongside leading AI scientists like Google director of research Peter Norvig, University of California, Berkeley computer scientist Stuart Russell and Microsoft managing director Eric Horvitz. The letter states that the development of autonomous weapons, or weapons that can target and fire without a human at the controls, could bring about a "third revolution in warfare," much like the creation of guns and nuclear bombs before it. Even if autonomous weapons were created for use in "legal" warfare, the letter warns that autonomous weapons could become "the Kalashnikovs of tomorrow" — hijacked by terrorists and used against civilians or in rogue assassinations. To everyday citizens, the Kalahnikovs — a series of automatic rifles designed by Mikhail Kalashnikov — are better known as AKs. "They're likely to be used not just in wars between countries, but the way Kalashnikovs are used now ... in civil wars," Russell told Tech Insider. "[Kalashnikovs are] used to terrorize populations by warlords and guerrillas. They're used by governments to oppress their own people." A life in fear of terrorists or governments armed with autonomous artificially intelligent weapons "would be a life for many human beings that is not something I would wish for anybody," Russell said. Unlike nuclear arms, the letter states that lethal autonomous weapons systems, or LAWS, would "require no costly or hard-to-obtain raw materials, so they will become ubiquitous and cheap for all significant military powers to mass-produce." But just how close are we to having usable autonomous weapons? According to Russell, affordable killer robots aren't a distant technology of the future. Stuart wrote in a May 2015 issue of Nature that LAWS could be feasible in just a few years. In fact, semiautonomous weapons, which have some autonomous functions but not the capability to fire without humans, already exist. As Heather Roff, an ethics professor at the University of Denver, writes in Huffington Post Tech, the line between semiautonomous and fully autonomous is already quite thin, and getting even smaller. Six Pakistani students are participating in the inaugural FIRST Global Challenge robotics competition taking place in Washington DC, according to a press release issued by US Embassy on Friday. The team will collaborate with other teams from across the world "to accomplish engineering tasks focused on access to clean water", the statement read. A mentor accompanying the team, Ali Syed, noted that the students had been actively preparing for the competition for weeks after winning a competition organised by Lets Innovate. "Our team is honoured to represent Pakistan on this international stage and to show that Pakistani students have a passion and an aptitude for solving problems through robotics," Syed said. American Embassy Chargé d’Affaires Jonathan Pratt met with members of the team before they departed for the United States and encouraged them to "collaborate actively with their counterparts from the US and approximately 160 other nations". "I hope you take advantage of the opportunity to share ideas about how to use robotics to solve some of the biggest problems that Pakistan, the United States, and other countries around the world face," Pratt said. Air University Vice-Chancellor Air Vice Marshal (retd) Faaiz Amir announced during a press conference on Tuesday that Pakistan’s largest technical and scientific Olympiad “Airtech’17” will be held at the main campus of Air University from December 7-10. The Olympiad would include 26 technological competitions as well as other value-added events like an AirTech conference, embedded workshops, a national photography competition, project expo, an aeromodelling show, an air techno-show, bonfire, sky lantern show and more. Air Chief Marshal Sohail Aman will deliver his keynote address as chief guest on the occasion of AirTech’17 Conference. “AirTech’17 is designed to serve as a platform where a fair and competitive environment will be provided to young students to design, build & present technical solutions and perform innovative tasks in respective fields by utilising their creative skills blended with their scientific academic knowledge and technical capabilities”, the Vice-Chancellor said during the briefing. While talking to media, Students Affairs Deputy Director Ms Fazaila Ali Qazi said that the chief guest would deliver his keynote address on “leadership, education & society development” on December 7. It will include various topics related to robotics, artificial intelligence and other emerging technologies. Furthermore, student competitions will be held on the second day and would be divided into five key categories – robotics, mechanical, electrical, computer sciences and applied sciences. A “TechnoShow” will be held on day 3 of the Olympiad. The show will include events like “AirBot”, “Robo War”, “Quadro Show” and “Robo Dance”. As a secondary activity, a workshop on international scholarships will also be held on the occasion. On day 4 (Sunday), a tremendous Air Show will be presented over F-9 Park in Islamabad. The Project Expo will also be held on the concluding day, followed by a sky lantern show. AirTech’17 aims to enhance and polish the conceptual, analytical and practical skills and expertise of youth, with the intention of cultivating and nurturing their talent, thus enabling them to envision themselves to be the future of a dynamic and technologically advanced Pakistan. Time Dimensions Middle East & Africa (TDMEA) a leading UAE-based technology firm with exclusive regional rights to South Korean robotic education brand, RoboTami signed a tripartite memorandum of understanding with Association for Academic Quality (AFAQ) and Institute of Policy Studies (IPS) to promote and provide robotics and artificial intelligence education solutions from pre-primary to university level in Pakistan. This was stated in a statement issued on Saturday. The joint venture facilitated by IPS is aimed at providing the educational sector of Pakistan the curriculum, training, and labs to prepare the new and future generations of the country for the challenges posed by the fourth industrial revolution. The unique element of RoboTami an indigenous model of the South Korean education system is the creative convergence of Science, Technology, Engineering, Arts and Math (STEAM) as theory and robotics as practical. RoboTami is a complete, one-stop solution for robotics education for schools, colleges, science and engineering universities and technical education institutes.